“I walked the Piemont route from Lourdes to St Jean Pied de Port in September 2015 with only a French guide book, and I don’t speak or understand French! Needless to say, it made the journey at bit more challenging. So I am thrilled about your book and hope to walk the route again this year with your guide book in hand. And what an incredible, beautiful route it is!” said Fred Bovenkamp, on Camino de Santiago.me forum today. Learn more about the Lourdes, France, to St Jean Pied de Port route by viewing the Camino book, Spiritual and Walking Guide: Lourdes to St Jean Pied de Port, on Amazon at http://bit.ly/LourdesCamino. By Stacey Wittig, Camino pilgrim. The only English version spiritual devotional and walking guide for this part of the La voie du piémont pyrénéen. Available now in paperback or Kindle. Author Stacey Wittig was honored to be interviewed by Rudy Maxa from Rudy Maxa’s World with The Careys last week. The interview was broadcast from the chic lobby lounge of Hilton Sedona Resort at Bell Rock in Sedona, Arizona. The radio program reaches over 275+ weekly radio stations each week across the USA. Bell Rock happens to be the site of one of Sedona’s four major vortexes of earthly energy and a spiritual place for Native Americans and others. Stacey and Rudy talked about hiking in #Sedona and her new book, Spiritual & Walking Guide: Lourdes to St Jean Pied de Port in the comfortable “Living Room” of the Hilton Sedona Resort. The book was written to enhance the spiritual experience of pilgrims walking from Lourdes to SJPP along the Way of St James. The show has a weekly audience reach of approximately 1.4 million via approximately 275 affiliated network stations, a 24/7 TuneIn.com channel, growing social media platforms, frequent remote broadcasts, online and more. The “Living Room” or Lobby Lounge of the Hilton Sedona Red Rocks Resort and Spa. Many modern pilgrims desire to walk the primitive pilgrimage route from Lourdes to St Jean Pied de Port, France, and beyond onto the Camino Frances. But, until now, few guides have been published in the English language for the Voie du Piémont Pyrénéen sections of the Camino walk. The three-in-one book incorporates daily devotionals, Bible verses and way guides that will help prepare your heart for a closer walk with God. or many years to come. Stacey Wittig is a Spirit-led Christian, who was transformed by the Camino de Santiago experience and now writes about hiking and pilgrimage. 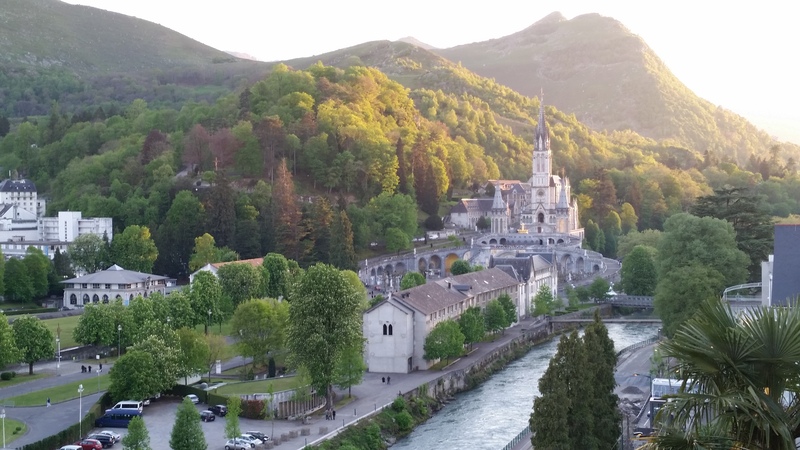 I arrived in Lourdes, France, trusting that there would be “room at the inn.” The albergue that catered to people walking Les Chemins de St Jacques (The Way of St James) had not returned any of my email requests for a bed. The week before, the Lourdes Tourist Office assured me that the proprietor was out of town and would respond once he returned. So I walked by faith, trusting that even if no beds were available at Accueil Jacquaire “La Ruche” when I showed up, that there would be space somewhere in the mountain town of 15,000 for a pilgrim to lay her head. Hey, even Baby Jesus found a manger to sleep in as his family journeyed to Bethlehem. Lourdes is known as a center for prayer and healing for the Catholic Church. Six million people travel to the town in the picturesque Gave de Pau River Valley every year in hopes of healing for themselves, friends or family members. In 1858, teenager Bernadette Soubirous saw the Virgin Mary in a muddy grotto not far from the river. The Virgin appeared to the peasant girl eighteen times, and during one of the appearances, the Virgin told Bernadette to drink the water. But there was no source of water in the grotto. Bernadette felt compelled to dig in the mud with her hands, and soon she unearthed a spring. Bernadette drank from the spring and prayed. Later, others were miraculously healed after drinking the water. Today that small spring is the water source for the bath houses where believers are submerged in the healing waters and for the fountains from which devotees drink thousands of gallons of water. Since foot traffic on Camino Frances has increased so much in the ten years since I did my first pilgrimage, I desired to start on a road less traveled. The route from Lourdes to St Jean Pied de Port seemed to fit the bill. Fewer people and more rustic accommodations might better mimic my first Camino experience. However, because the Lourdes Camino route is typically traveled by regional hikers, the only guidebooks that I could find were in French. Even on-line, route-following instructions were in French. Google Translate and other free translation services didn’t seem to get the detailed, cryptic instructions right. “Cut a road and continue straight. After a closed, follow the path paved route and continue the length to the edge of the Louts.” Hmmm… Yet I had printed the cryptic instructions and bound them with pages of maps from the French guidebook, La Voie des Piemonts un Chemin de Serenite by François Lepère and Yvette Terrien. I shared a cab with two other visitors, and David, the friendly driver knew the way to Accueil Jacquaire “La Ruche”. I tapped lightly on the door, and when no one answered, I pushed it open. “Bon jour,” I called out. A young American woman came down the stairs. “Hi, I’m Rachel. We’re making dinner upstairs. Do you want to stay for dinner?” Rachel offered. 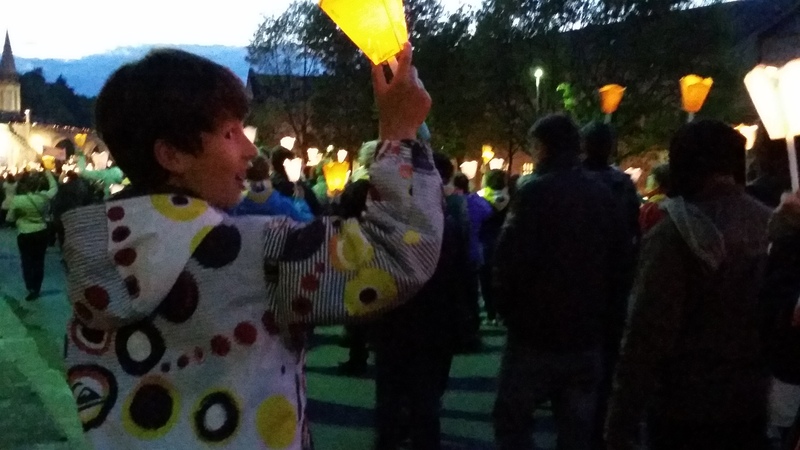 “After dinner will there be time to go to the candlelight procession?” I asked. It was the desire of my heart to start my pilgrimage to Spain with the prayer vigil and processional that happens every night at 9:30. Hundreds of people from all over the world come together for prayer, many wheeling their loved ones in wheelchairs or gurneys. I had seen it all on YouTube and wanted to experience it for myself. “Yes, there will be plenty of time,” Rachel said. “We’ll all go down together, we have several other pilgrims here tonight. Jean Luis and G.G. have the candles here. She pointed to a basket of tall candles with Lourdes-appropriate wind shades. Stacey gets her shell from Hospitalero Jean Luis Doux, who cuts a yellow cord to tie it to her pack. 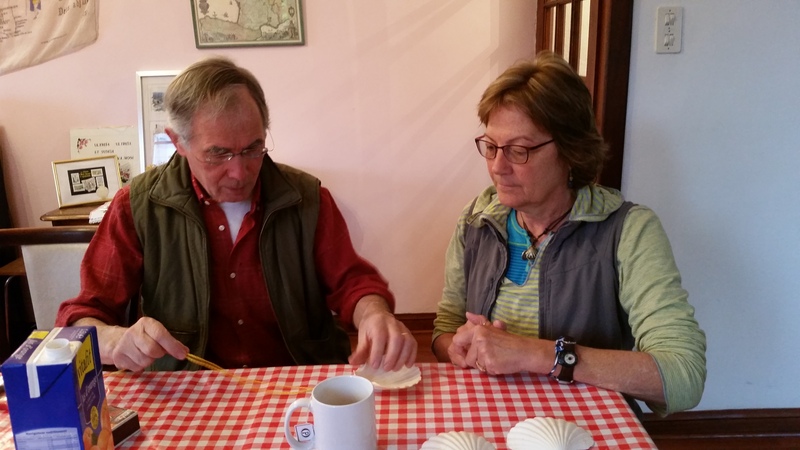 “Are you just starting your Camino?” When I nodded yes, my new friend responded, “Well, we’ll have to get you your shell tomorrow before you leave.” The scallop shell is a symbol of St. James and is worn my pilgrims to denote that they are on a pilgrimage to Santiago, where the bones of St. James rest. 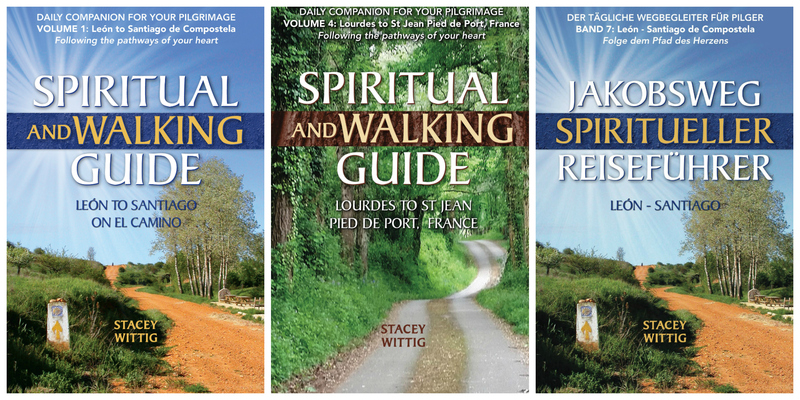 Stacey Wittig is a travel writer who is currently working on her second book, Spiritual & Walking Guide: Lourdes to St Jean Pied de Port. Order her first book, Spiritual & Walking Guide: Leon to Santiago on Amazon. What about pilgrimage helps you let go of fears and find peace that passes understanding? How can you be still and hear God’s voice as you trek the ancient pilgrimage route? 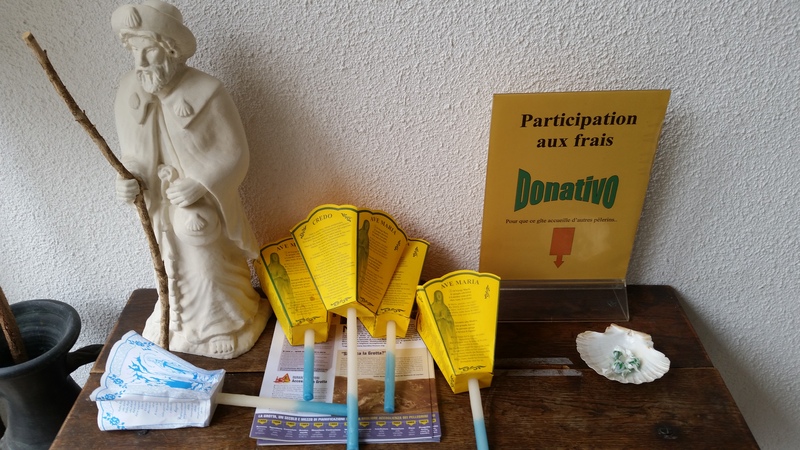 How will you prepare your heart for a closer walk with God on Camino de Santiago? Find answers to these and other questions in this series of Spiritual and Walking Guides. Volume One: León to Santiago. Volume Three: Lourdes to St Jean Pied de Port.